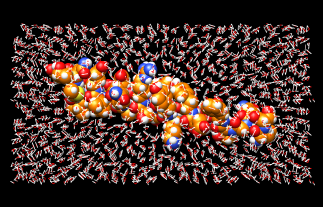 Solvate adds solvent around molecule models using AmberTools. Thanks to Wei Zhang (The University of Texas Health Science Center at Houston) for implementing this tool. There are several ways to start Solvate, a tool in the Structure Editing and Amber categories. It is also implemented as the command solvate. The model of interest should be chosen from the list. Multiple models can be chosen, but they will be considered individually rather than as a combined system. Solvent addition requires explicit hydrogens. If the molecule model does not include hydrogens, a dialog for running AddH beforehand will appear. Shell - a layer of solvent extending Shell extent (Å) from the solute. The shell will be irregular in shape since it reflects the contours of the solute. One can Remove existing ions/solvent (recommended) before solvating the system. The affected atoms are those automatically classified by Chimera as ions and solvent. Partial charges corresponding to the chosen solvent model will be assigned as the attribute named charge to atoms in the existing (if not removed) and newly added solvent residues. The process of solvation may move (translate) the structure. OK initiates adding solvent and dismisses the panel, while Apply adds solvent without dismissing the panel. Addition may take several seconds; progress is reported in the status line. Close dismisses the panel without adding any solvent. Help brings up this manual page in a browser window. See the AmberTools documentation for further details.